STIR (Sustainocratic Transformation, Indexation and Research) is a research oriented foundation dedicated to finding those evolutionary community mechanisms of society that provide both quality of life and sustainable human progress in times of extreme local and global challenges. The foundation was established in 2009 by Jean-Paul Close who, after a long international executive career, had awareness breakthroughs that opened up his eyes to the serious vulnerability of our current human existence. Awareness of our serious risks lead to the desire to look for alternatives and experiment with new insights to find evolutionary progression without the drama of disruption. Core natural and human values need to be regionally respected and sustained for a harmonic, innovative, productive and sustainable relationship with our surroundings and among each other. STIR formulated 5 such core values: health, safety, shared resilience, awareness and fullfillment of the basic local needs (quality food, drinking water, healthy air and energy). If they are not respected the absence invariably leads to all kinds of crises. Shared responsibility is the basis for developing the core values. This introduces a new layer of interaction between policy making hierarchies, business development, science and local citizens. This layer is referred to as level 4 regional development through level 4 (awareness based empathy with core values) leadership. As soon as layer 4 appears and becomes operational the community becomes a Sustainocracy. 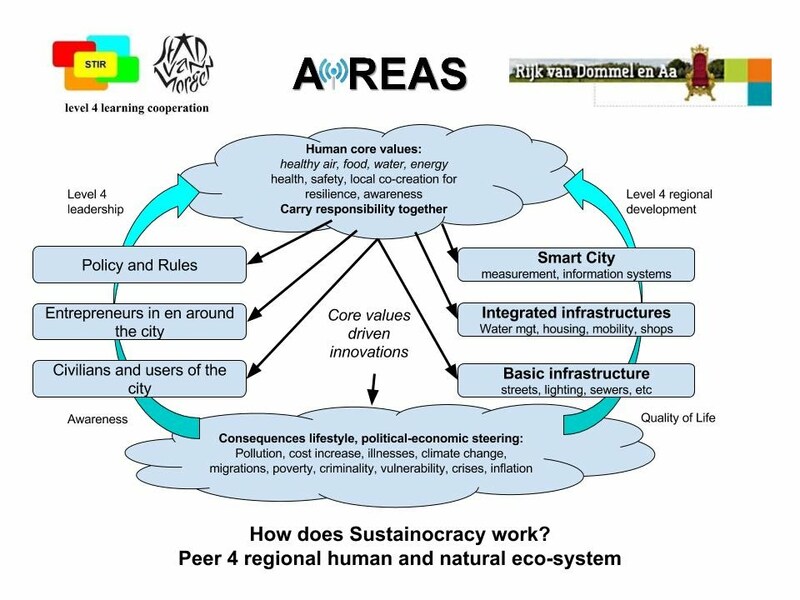 In 2010 the first Sustainocratic community was established and called AiREAS. This cooperation concentrates on the multidisciplinary interaction to achieve healthy regions through the monitoring of air quality, human health and lifestyle. The STIR level 4 learning cooperation captures all experiences and new knowhow for deployment elsewhere. The drawing below shows the mechanisms of level 4 sustainocratic interaction. Insights and experiences are being published in open access through the channels of Springer and other worldwide publishers. Sustainocracy is now seriously being considered and introduced in many regions of Europe. It can be introduced by single individuals who position themselves as local Sustainocrat and take on the task to invite all local stakeholders to take a seat at the table of prioritization of the development of the core values. When this happens a new economy of innovative development appears which both solves local issues, brings local cohesion and strengthens the economic relationship with the surroundings.